Red stems on a shrub that supports a wide variety of wildlife. It is unknown exactly where the Flame cultivar came from, but is likely a cultivar of a native willow. Willows are biodiversity superstars, with leaves that support a large variety of butterfly caterpillars. 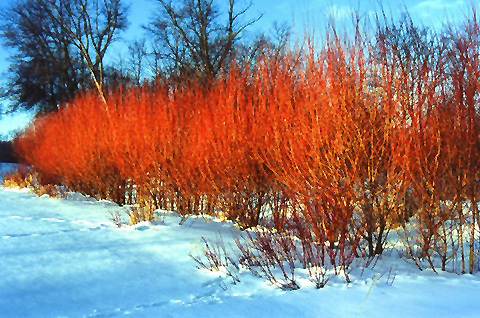 Flame has bright red stems all year round; the stems are particularly striking in the winter when the willow’s leaves have fallen.